Our ACA U.S. insurance plans do not cover emergency evacuation coverage outside the U.S. Depending on medical care needed and location the average medical evacuation is between $20,000 – $40,000. Since we have been in business since 1997, we have seen, sadly, many evacuations needed for our clients. We have seen them as low as $15,000 and as high as $112,000. The second question usually asked by any medical facility overseas is – which credit card would you like us to use? For me, I prefer my international medical insurance card, thank you! Thus, when I travel overseas I always have a travel medical insurance plan that also has evacuation cover. What happens if you break your leg or get into a vehicle accident and need to be air evacuated in our outside the country to the nearest and best hospital? Can you pay for that evacuation cost out of your own pocket? Or would you prefer one of our international insurance companies to handle that charge? Who would set up that evacuation transportation? Would you prefer a local police officer /local medical staff to set up your evacuation or a tried and trusted international medical insurance company? All of Good Neighbor Insurance’s travel medical plans we carry have evacuation insurance. 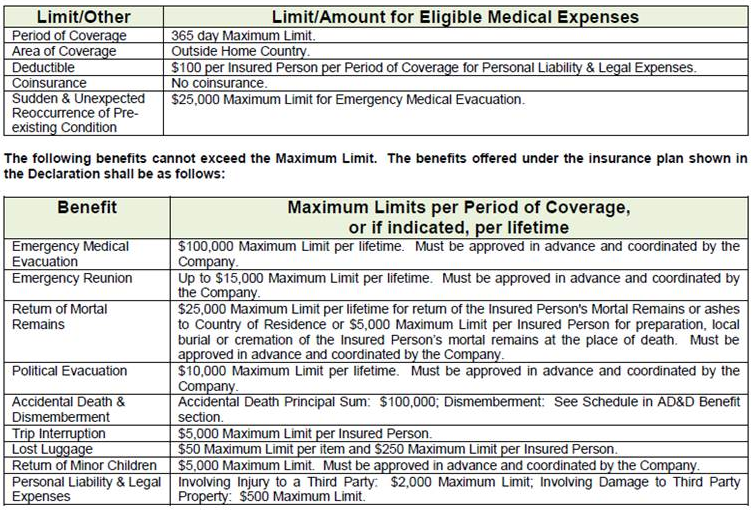 Here is information on our top emergency evacuation only (no international medical insurance) travel insurance plan. It is the most cost effective option for any of us. You may go to our web page at https://www.gninsurance.com/sky-rescue-emergency-medical-evacuation/ or call one of our trusted international medical insurance agents toll free at 866-636-9100 or email us at info@gninsurance.com. This policy is designed to assist them with the transportation and evacuation needs should they become injured and are not able to acquire the needed treatment where they are. This plan does not cover the medical expenses, just the evacuation. Those evacuations need to be coordinated by IMG so if something does happen please let them know to call us first. It really is much easier to let us do all the work. Another item for them to keep in mind is that the policies do not cover pre-existing conditions. Pre-existing conditions are defined by the policy as any Injury, Illness, sickness, disease, or other physical, medical, Mental or Nervous Disorder, condition or ailment that, with reasonable medical certainty, existed at the time of Application or at any time during the three (3) years prior to the Effective Date of this insurance, whether or not previously manifested, symptomatic or known, diagnosed, Treated, or disclosed to the Company prior to the Effective Date, and including any and all subsequent, chronic or recurring complications or consequences related thereto or resulting or arising therefrom. Having said that, the policy does offer limited coverage (up to $25,000) for Sudden and Unexpected Reoccurrence of a Pre-existing condition. Below is a snapshot of some of the benefits of our Sky Rescue plan. Please go to https://www.gninsurance.com/sky-rescue-emergency-medical-evacuation/ for the most up-to-date information.